Created By Nick Mainardi Jr.
You are at the cornucopia, as the intense pulses of fear flow through your veins and BOOM! The gong went off! What do you do? Run in, grab a weapon and go. Run in, grab food and go. Run in, grab supplies and go. Run away, you don't want to get killed. Run in and fake it, then run away to trick the others into thinking you're in. You survived through the cornucopia. A tribute is coming towards you as you are stranded in a tree. What do you do? Kill him with my bow and arrow. Stay in the tree. My plans to kill him could backfire. Fall on him, it's a long fall, but it'll knock him out, and I'll kill him. You're starving as your eyes can't bear but to notice berries on a bush as your stomach is STARVING! What do you do? Take a small bite, then if you feel any strange feelings eat them. Just move along. Don't want any chances of death, do I? Eat them! My stomach really hurts! Wash the berries, than eat them. Lightning is beaming down at the lake you are currently at now. A tribute is about 3 ft. Away from you, but she doesn't know that you are there because the lightning is too loud. What do you do? Take her by the hand, and run off. You can become allies and both not die. Push her in. It'll finish her. A tribute is on top of you, about to stab your throat. How do you get her off? Spit in her face, that assault her. Finish her. Try to knife her. But the knife is a long way away from you, and your hands try to grip around it. Well, who knows? Maybe you will kill her. You see the careers (Districts 1, 2 and 4 aka the strongest districts) looting your base from a far away distance. What do you do? Leave them alone. I know all of my stuff is there, but, tough. Run up to them and try to kill them off. Duck down into the bushes as soon as you shoot one. You see the SMARTEST tribute in the games in the trees. You want him as an ally, but your afraid his intelligence and cunning skills will harm YOU instead. What do you do? Kill that slob. I should win, not him. I'll pull out that bow. Use your stealth to climb the tree, and when he looks away, stab him. He'll die. Say to him, "BE MY ALLY!" And scream it out loud. Sadly, your not ready for the Hunger Games. You died, but you proved yourself worthy of being an excellent tribute. Dang it! You died, although you were so close to being in the top 5! Great job! Oh my! You were a great tribute, but sadly, everybody dies. So close to being the winner, but not close enough. You won! You're the best tribute! 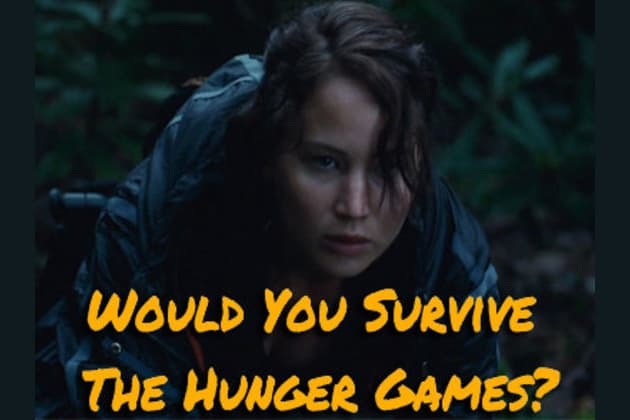 Take this test, to see if YOU, could survive the brutal, deadly Hunger Games!